Last Thursday I stopped by Steam several times to see if Handelabra‘s port of One Deck Dungeon was live. One of these trips — for no good reason — I scrolled down to read current Steam reviews. Negative reviews weren’t hard to spot, all complaining that this game uses too much “RNG” which is, apparently, a cool thing all the kids are saying. It means random number generation and if you’re complaining about randomness in a game that has you chucking literal handfuls of dice each turn then maybe you’re playing the wrong game. One Deck Dungeon is nothing but randomly generated numbers and, if you’re into that kind of game –other ports I can think of are Elder Sign and Roll for It! — then you’re in for a treat. I’ve already reviewed the cardboard version of One Deck Dungeon from Asmadi Games and concluded that it was a great solo game that’s easy to shove into a backpack and take with you. Handelabra’s version is even easier to pack, especially if you’re already dragging along your laptop or tablet. The gameplay is the same: pick one or two heroes and a boss dungeon, start flipping cards and rolling dice and see how long it takes for your characters to die [we have heard rumors of characters not dying, but find such tales hard to believe -ed.]. Monsters, traps, puzzles, obstacles and other dungeon tropes are all abstracted into different colors of dice, each representing one of your character’s attributes. Red dice are agility, yellow are strength, and blue are magic. Mages, then, would begin their journey rolling more blue dice than yellow, whereas a rogue is heavy on red dice. You might find a locked door that you can choose to back open (using your yellow dice) or pick the lock (using red). It’s not very difficult to grok, so I’m assuming you all get the idea. Spikes. Why did it have to be spikes? The fun of One Deck Dungeon is building up your character with different items, skills, potions, or adding levels and seeing if you built the perfect killing machine to make it to the boss monster on level 4 of the dungeon. Kill the boss, you win. Anything but, you lost. The main mechanism is chucking all the dice from your character’s dice pool and assigning them to the colored squares on the challenge you’re currently facing. If you cannot cover up all the boxes, then you’ll lose either time or hit points, bringing you closer to the boss or death, respectively. Actually, the boss will probably kill you, too, so both penalties are simply bringing you closer to death. Determining how to fill the boxes on each card is what turns this from Fantasy Yahtzhee into something that will have you using your noodle. A bit. It ain’t 18xx, but I’d hope you know that going in. Still, despite its love of dice, there’s a lot to ponder each turn. Items you find in the dungeon let you add either yellow, red, or blue dice to your pool, but the skills let you spend dice to do other stuff. Spend one yellow dice to add +1 to up to 4 different dice or spend a red dice to roll 2 yellow dice. It’s the kind of thing where you’ll start saying to yourself, “now, if I spend that there and roll this, then I can cover that, but I won’t have that red dice to cover that, so maybe I spend this dice…” If that kind of thing isn’t your bag, then stay far away from One Deck Dungeon. As we’ve come to expect from Handelabra, the digital version is flawless. I have yet to see a bug and, while it plays just fine on my laptop, it really shines on a tablet. I’ve been playing this on trains and planes and buses for the past week or so and it’s a perfect fit for mobile. Every card, whether you cover all the boxes or not, gives you a choice of loot. 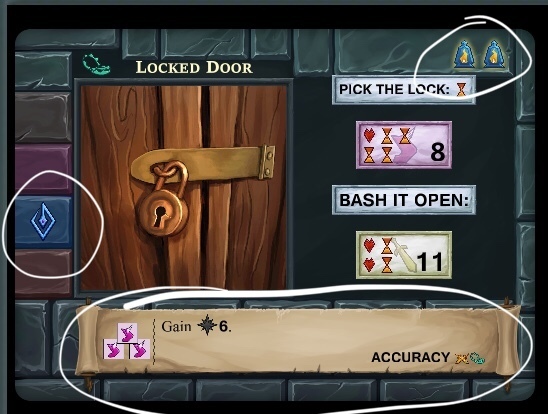 The app is polished with subtle animations when you open doors that are much, much better than just flipping a card, but none of the animations or sound effects get in the way or slow gameplay down. If you’re just an old curmudgeon, you can speed them up to the point where they happen so quick you can’t even notice them. Don’t do that. Hero Progression is pretty cool. The app also has a Hero Progression mode which is a neat way to take a character along on several dungeon crawls and build them up with special abilities as they advance. Even if you die on the first floor you’ll get a couple points to spend. There are a ton of options and cool things to unlock with each Hero, and I’m really looking forward to seeing what powers I can unlock with my mage. As far as board game ports go, One Deck Dungeon is one of the lightest out there. If you’re looking for another Through the Ages, Terra Mystica, or Twilight Struggle, you’re looking in the wrong place. One Deck Dungeon is a quick filler game that you can play through in a few minutes while still making a ton of choices and decisions along the way. Yes, your game can end due to one bad dice roll. If that bugs you, don’t buy this game and, for the love of god, don’t write a review for it on Steam. eta - just realized the 23rd is tomorrow… yippee! Maybe they’ll bring it to phones later–Sentinels started off iPad-only, if I remember right. I’m glad to hear the tablet version is so good, too. Makes me feel even better about waiting the few extra days to buy it. Thanks for the review, Dave. This looks like a fun, easy to pick up title to me. But I will restate my dislike of the price. $10 for what has now been dubbed officially as a light filler game is too high for ios or android. The production values look great, though, and I will look forward to a sale. I’m willing to spend $10 for a high quality game, but at that price point it becomes a deliberate decision to purchase a specific game rather than a thought-free impulse buy. I’ll be doing a lot of traveling this summer and have little to no interest in a tablet-only game at the moment. ODD will definitely be on my wishlist, though, for future consideration. It’s really interesting. Using my patented $1 per hour of entertainment model, I suspect I would get my money’s worth. So the price point does not bother me. Except that on Steam, this would fit into the same space as Slay the Spire - a game that I tend to play casually in a hotel room or on a plane during business travel and I am on my laptop and have in the 15 minutes - 1 hr range of time. On the iPad, my time is fully taken these days between 4 games, and there just in no room for this. But it looks fun. I will put it on my wish list on Steam, but it’s likely to be there a long time. I think I’m going to buy it because I don’t have anything really taking up my iPad time these days, and I do believe I’ll get my money’s worth. I tend to agree with @kennfusion–$1 per hour of gaming time makes for a worthwhile purchase. Up on Android, but it’s device locked to tablets, so I’m unable to check it out. Enjoying it quite a bit on Steam though. They’re having Apple troubles, hence the non appearance on the App Store. Hopefully getting it straightened out soon. I keep checking the App Store. No wonder. I do believe that there is an inverse relationship between the quality of an app and the ease at which it is fast-tracked through the approval process. I just got it for $11.49 CDN. That’s with the discount? Yikes! But happy to support good mobile board gaming. I was excited for the One Deck Dungeon to come out. I thought about getting the cardboard version but thought that it wouldn’t get enough play. I was so excited when the announcement came out, so I gave the Steam early access version a go. And, as I played it, knowing that was rough, I thought “this would be much better on a tablet”. So… I’m enjoying this a lot more than I thought I would. It has that “one more turn” grab about it. I sank about two hours into it yesterday, yet didn’t win a single. damn. game haha. There’s a little bit of strategy involved in choosing where to put your dice, when to burn time, and what loot to take, but for the most part it’s a filler game. Still pretty enjoyable and worth the price of admission; admittedly, it’d get a lot more play if it lived on my iPhone. Great first post! Don’t let it be your last. This game is my new addiction. Definitely glad to get it for $8. So far, I’m enjoying a party of one more than two, but it’s great either way. It’s also difficult to choose between learning a new character or advancing further with a leveled-up character. Note to self: tell my family and friends I still love them, even if I’ve been playing this game almost every waking hour recently. Just played my first game and dealt 4/6 pips to the boss before I croaked. Not bad. The presentation isn’t super flashy, but I think that’s a pretty good thing here. About the biggest nitpick I think I’d have is that the interface is a bit quirky, wanting tap and hold in some places double tap in others. Very solid implementation at a glance and looking forward to spending more time with it. Speaking of the interface, thank God for the Undo feature. I don’t know how many times I’ve wanted to see what a skill/potion does and inadvertently chosen it. Yeah, I actually had that happen with a door. I’d left it open, then got an invisibility potion from another door. I went back to check on the rewards to see if it was worth doing, and entered the room when all I wanted to do was look. I don’t think I had the option to undo there. But that’s the sort of thing I meant with the interface. It is inconsistent. At any rate, won my second attempt at the boss quite easily in 2 rounds with half my health left (10 health on a paladin is pretty ridiculous) and potions to spare. I gotta learn how you do that… Beat a boss, I mean. I’ve had better luck with a Mage than anything but maybe I will try the Paladin again. Are all of you having better luck with one hero or two? I would have thought the second hero would be more helpful, but I’ve gotten creamed every time I play with two and done marginally better with one. Only tried two once so far, but I didn’t fair very well. Paladin feels like easy mode to me, so if anyone is having trouble give the pally a go. Did try the mage last night for the first time and had one few too many health. Would have killed the boss on the turn I died. I think you can actually see the loot options on a room you flee—check out the screenshot below for an example. Item is on the left, skill to learn is on the bottom, and XP are on the top right. Glad to help. The icons are small enough that I’m not sure how I did notice them! And thank you for the paladin advice—helped me finally pull off a win. I have to say the paladin starting skill seems miles better than some of the others. You can effectively soak 6 damage = 1 potion if you play it right. Compared to that, why is the mage shield so weak for instance? At least let it work in combat. I’m sure it is intended to balance out their feat, which accumulates dice much more readily. Finally won a game. Used the Paladin and got lucky In few instances and the used the fact she absorbs a large amount of damage. I will give no more spoilers. Pretty good game. Already got my money’s worth out of it. Finally won with the rogue; I clicked quick game just to see what would happen, and apparently it throws you a random character in a random dungeon. Still wish this lived on my phone, but otherwise a great game. Are people playing this with character progression (or whatever it is called)? I lost my first game against the dragon playing as the archer and easily won the next two against the dragon. Now I’m building up the archer by losing to the hydra. I think a few more improvements will make the hydra a possibility. If you are playing without character progression and able to beat the hydra, ect. I’m really amazed. You get green circles for the easiest boss, the dragon. Red pentagons for the hardest bosses, and squares for the intermediate bosses. At the start of the adventure, the number of dots under the bosses indicates the difficulty. When you fill in all the spots for a skill you get to use that skill provided character progression is selected. But only a basic and one other skill are allowed. You don’t get to use all the skills. I’m also playing it on standard difficulty. Just beat the Hydra. I think the key is to get the additional dice and the skills to modify the dice. Thanks for clearing that up - so to unlock the skill, you need the circles, squares, and pentagons? I’m all about character progression, too. Is it possible to see details of what you unlocked for each hero outside of the screen where you assign circles, squares, and pentagons? When you choose a hero at the start of each run, there’s a one word skill description, but that’s it. To unlock the skill you need all the circles, squares, and pentagons for that particular skill. If you tap and hold the skill, a full description of it pops up. And it cycles to the next skill, so you have to tap it a few more times to get it back to the skill you want. I don’t have multiple skills unlocked yet (besides a basic and healing), so I don’t know how to select a particular skill yet or category. I like how the game keeps track of the statistics. So I know that I’ve rolled more 1’s and 2’s than any other number. I don’t just feel that way. I just wanted to share that I’m really enjoying this game. The hero progression is nice because playing the harder bosses doesn’t seem possible otherwise (or I’m really not good at this game). During the dungeon crawl, I’ve focused on increasing the number of die and the skills. I’ve only ever taken the potion skill that allows two die to be converted to sixes. I save the potions for healing. Typically I get to level 3 only made it to level 4 once with a two party group. The 2 extra black dice is nice at level 4, but so often I don’t have enough experience to go for leveling up. Using the skills is how I mitigate bad rolls. Figuring out the right combination can change something that appears disastrous to a victory. Right now I’m trying to progress all the hero before tackling to two hardest bosses. Does anyone use a different strategy?